On Saturday, 25th of August, the TED-Ed club of K.R. 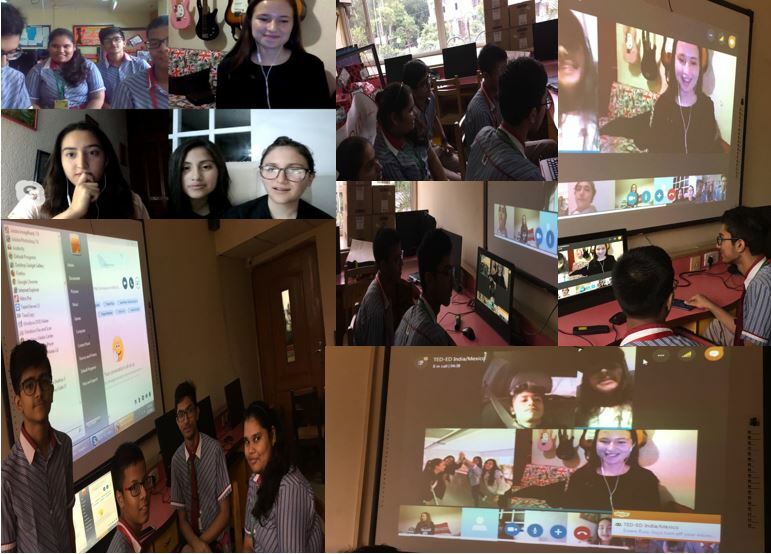 Mangalam World School, Vikaspuri, conducted a video conference with the TED-Ed club of Monterrey Institute of Technology and Higher Education, Toluca Campus in Mexico. The theme of the videoconference was about discussing the cultural dynamics between India and Mexico and respective TED Ed Club experiences and ideas. It was a brilliant opportunity for our TED Ed Club members to learn about the different culture and places. As thrilled as the students were to reach out to people who were half way across the globe, they also loved interacting with another TED-club and discuss their ideas and efforts. Our conversation ranged from all sorts of serious topics like what we’d like to change in the world to light-hearted fun topics like Harry Potter and food! From Tacos to Naans, Enchiladas to dals, corruption to poverty, we discussed and learned many new things, like the festivals and cultures of respective countries. We discussed music, tastes and passions and recommended each other songs. The students discussed about the functioning of respective TED Ed Clubs, and their respective activities. The students beamed with pride as they discussed their respective projects, like sending condolence letters to mass shooting survivors, collecting resources for the Kerala floods and many other such activities. We believe our conversation held the perfect balance of learning and fun.